Ages 11 - 16. 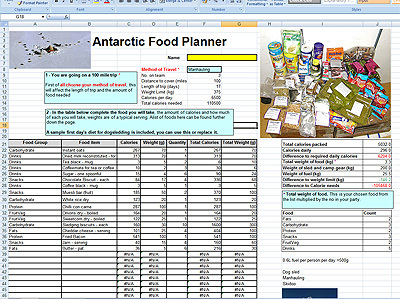 Investigate the nutritional requirements for an Antarctic field trip using a spreadsheet. The premise is that you are about to go on a 100 mile journey into the "Field" - that part of Antarctica (the vast majority of it) that isn't on a base, to undertake a scientific survey. The associated spreadsheet allows you to choose your method of travel, skidoo, dog sledding or manhauling. This then gives you your timings and requirements in terms of food and fuel. This kind of trip is still carried out in Antarctica today, skidoos (snow mobiles) are used for modern travel, the last dogs were removed in 1994 while manhauling was a common method for covering long distances during the Heroic Age of Antarctic Exploration from 1897-1922. A 9 dog team on firm snow with a Nansen sledge could haul up to 545kg (1200lb) over 16km (10 miles) per day, dogs were 32-40kg (70-90lb). The sled weight is fairly constant (all three methods will use a Nansen sledge) as any heavier will sink into the snow further and be disproportionally difficult to pull, on a good surface it is surprisingly easy to manhaul very heavy weights. Manhauling speed is probably on average about 7 miles per day while a skidoo could do 3 times this in an 8-10 hour working day. These are average distances that can be covered across a variety of conditions, on a very good day, much more could be covered and on a bad day, much, much less. There are also "lie up" days where it is not possible to travel at all because of the weather conditions and when dogs and people still need to be fed. The purpose of this is to assemble a balanced diet for a day based on the calorie requirements when travelling in the field in Antarctica. It has a restricted list of foods that are included in food boxes for field parties and so avoids the usual issue of such exercises of a vast list of variables of the sorts of foods that students eat on a daily basis. I suggest you start with enough food for one day, this will be enough for many/most students, they could continue this for the whole 7, 12 or 17 days of the trip if required, using the same spreadsheet. Choose your method of travel, skidoo, dog sled or manhauling. This sets the length of time for your trip and the daily and total food needed. Assemble the food you need from the list, these are the kinds of food used in travel boxes in Antarctica. This has been started for you. Click on the first empty "Food Group" box (row 29) choose from the drop-down list. Click the "Food Item" box in the next column, choose the food, go to "Quantity" and select how many. You need to select enough food to turn the red (negative) figures in the "Difference to required daily calories" box to positive (green) so you have enough energy. Make sure you have a balanced diet of fats, protein and carbohydrate, the pie chart will change as you add or remove foods, make it match the example as closely as you can, a little different is ok. - Wrap up warm and eat well! I suggest you start with one day's food, you can add enough food for the whole trip if you want to carry on, boxes I27 and I28 will tell you if you have enough food in total but not too much weight on your sled. What work could they be doing? There's a whole range of things that field parties can do. One of the commonest is a geological survey particularly the collection of rock samples from isolated rocky outcrops and nunataks - the tips of mountains that stick up from the bedrock above the level of the ice cover giving an indication of all the geology hidden below the ice. Field parties also do work to verify that what is being seen by remote sensing from satellites and aircraft is correct by comparing ground level measurements of ice thickness from sample areas for instance, to make sure things aren't going wrong - which they sometimes do. 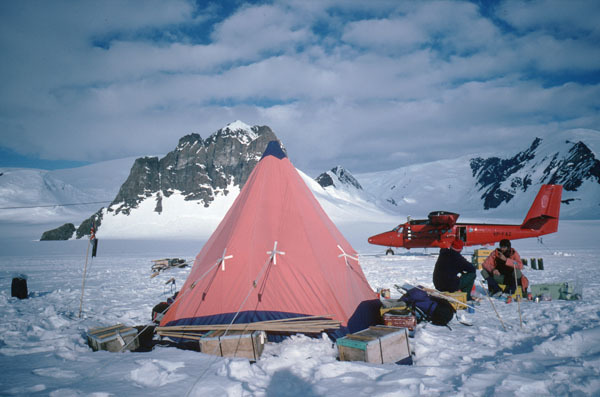 Field parties may camp for up to 100 days in the Antarctic summer months with periodical resupply by air. Picture - a modern field party is resupplied by air with food and fuel when deep in the field, many miles from the nearest base, the aircraft will also take out collected geological samples. Credits: Adapted from an idea and original spreadsheet produced by Carl Sheen, an IT teacher in England. Further information by Drummy Small from some notes made when travelling with dog teams in Antarctica for scientific purposes.